Perfect in pots, you'll be delighted with the gorgeous show of striking, violet-blue flowers in a double wave of colour. A Premium Double Flowered Patio Clematis, expertly bred by the world-renowned, award-winning nurseryman Raymond Evison. These striking, compact clematis plants are perfectly suited to a pergola or trellis all summer-long with their unusual, fully-double blooms. Bred to remain compact, they're perfect for smaller gardens or spaces such as patios, terraces and even balconies. Easy to grow and maintain but extremely rewarding, one of our most popular clematis! Supplied as an established plant in a 7cm pot. Plants are deciduous so will not have leaves Nov - April. 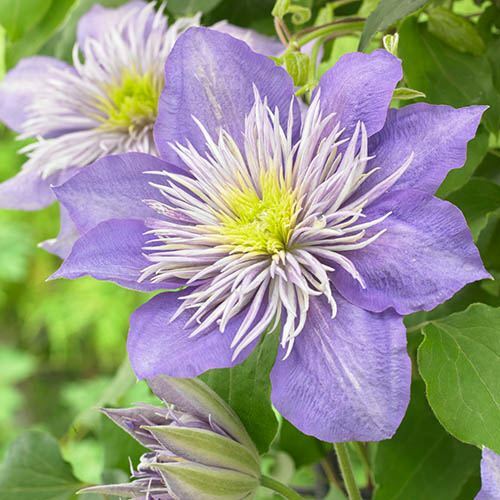 Expertly bred by world-renowned Clematis specialist Raymond Evison, these striking, compact clematis are perfect for growing up pergolas or trellis where their double, violet-blue flowers form a tower of colour. The compact habit of 'Crystal Fountain' makes this climber ideally suited to growing in a pot on the patio as they have been bred specifically for smaller gardens and patios where conventional clematis can be too vigorous. With a much-reduced height at 2m or so, Crystal Fountain erupts into a cascade of stunning blooms, each with a dainty fountain of stamens in the middle which often last longer that the outer sepals, giving a most unusual effect. A superb, repeat-flowering clematis, you can expect flowers in two waves, one in early summer and another in late summer/early autumn. Plants will always produce their double blooms even after a hard winter. Plant with the crown of the plant 5-8cm deep to encourage new shoots to grow from below ground level. Clematis like a cool ‘root run’ so try and plant so that the roots are shaded. If you are planting in a sunny position, place some pieces of slate or flat stones on the soil after planting or use groundcover plants to keep the roots cool. Feed in spring with a general-purpose feed, avoiding the stems. Mulch immediately afterwards with organic matter such as well-rotted manure, lea mould or garden compost. Water regularly during periods of dry weather in the first few seasons after planting, especially for container plants. Clematis in pots should be given a liquid feed through the summer and early autumn. Pruning is a case of a simple tidy up - in late winter/early spring simply reduce all stems down to 6in (15cm) of soil level.